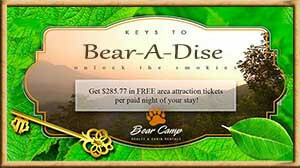 Bearadise 2 - Bear Camp Cabin Rentals. "Bearadise 2" is an enchanting, one of a kind, custom built cabin Located in beautiful Wears Valley and is nestled in Wilderness Mountain. It is a 2-story, 2-bedroom 2-bathroom cabin which will sleep 6. Located approximately 10 minutes from Townsend, 20 minutes from Pigeon Forge, and 30 minutes from Gatlinburg. There are paved roads all the way up to the cabin, and although there are some mountain roads and slight inclines, it is easily accessible and is considered motorcycle friendly at the riders' discretion and has comfortable parking for up to 3 vehicles. With only 3 steps to enter into this gorgeous cabin, you are going to be amazed by all the wood interior and all the comforts of home. On the main level, you will find an open floor plan for the kitchen and living room. After a long day of sight-seeing relax and kick your feet up in the comfortable recliner or unwind on the couch while watching your favorite TV show on the Flat screen TV. On those cold winter nights curl up in front of the gas fireplace with a good book and a cup of hot cocoa. Adjacent to the living room is the fully equipped kitchen with dining for 4. Also, located on this level is the Master bedroom with a King size bed, a Flat screen TV and private bathroom with a double vanity sink and a walk-in shower only. As you travel downstairs, you will find the game room with an air hockey table for those who love to play a friendly game. If you want to stretch out and enjoy the company of family and friends there is a cozy couch which will turn into a sleeper sofa and a recliner for those who just want to rest after a day at Dollywood. If you get chilled, don't worry there is a gas fireplace to keep you warm and cozy on those cold winter nights. Just off the game room is an additional King size bedroom, with a Flat screen TV, and a private bathroom with a tub/shower combination. Just outside of the game room is where the Hot tub is located. After a long day of hiking come back and jump into the bubbly hot tub and soak all your cares away. On the front porch and deck area relax and unwind with your morning coffee while taking in the wooded views and all the nature that surrounds you. If you like to grill, there is a charcoal grill with a picnic table for your enjoyment as well. Just bring your favorite food and charcoal and you will be all set. If you are wanting a vacation where you can escape from the hustle and bustle of everyday life, but still convenient to all the area attractions, then look no farther than "Bearadise 2" for your next mountain vacation. What are you waiting for? Book this gorgeous mountain cabin today!!!!!! Red Wolf Rest was as awesome as ever! So relaxing, covered porch our favorite! Thanks for a wonderful time! Very friendly staff. Helpful and willing to accommodate. Bear Camp Cabins was an awesome staff to work with. When first booking the cabin, I booked the wrong cabin at closing and called back the next morning to book the correct cabin for my family. They were extremely accommodating and fixed it right away (although there was supposed to be a fee for changing they never charged a fee). They have a hand print out and explain the directions to get to the cabin really well. They were even accommodating when my child got sick and needed new linens. We stayed in the Red Wolf Rest cabin which had a very at home cabin. They had all things provided in the cabin. My family and I would recommend staying in this cabin to anyone. We loved the cabin and the ease of dealing with bearcamp. We will definitely use again. The staff at the Bear Camp cabin Rental did a great job finding us a new cabin in a very short notice when the original cabin became unavailable. We appreciate that very much. You all are very good to work with. The red wolfe rest cabin was fantastic, hot tub felt good after a day on the motorcycles,felt secluded even thought there was a cabin just down the hill from us. The driveway was a bit sketchy (steep) when going into the first time then once figured out where to park them was okay. Watched an eagle flying around. I would rent again price was very reasonable. This was our first time visiting pigeon Forge and Gatlinburg area. Several friends recommend to get a cabin so we could enjoy the beautiful mountains scenery. The Red Wolf Rest was a great choice,with plenty of room. Also the visit of several raccoons the kids loved it ! Cabin was awesome, great views and cabin itself was very nice. We really enjoyed our stay here, and would definitely return again. Everything was amazing, bugs were bad, but you'll have that in the woods!! I enjoyed every moment of our stay. The staff were all very nice and courteous. Our cabin was very clean and actually bigger than we had expected. No complaints at all. Everything was great. The cabin was beautiful and we really enjoyed our stay. Thank you. Cabin and amenities were great. Lovely stay with excellent accomodations. Love Bear Camp Realty.. Cabin was amazing.. Clean enjoyable place to stay. Look forward to coming back again!! Bear cabins is an awesome place to stay with. We stayed in the Red Wolf Rest, Beautiful cabin. It was clean and very nice place to stay at. I look forward to returning for years to come! We all were very happy with the location and that we were out of the main tourist attraction area.The view was spectacular a nice wind to cool us off in the extreme heat of 103 degrees.Very Clean and comfortable.We had 4 adults and 4 kids and there was room for everyone.Bathrooms were big and nice.Washing machine and dryer works great.Hot tub was great.We loved sitting out on the deck the best.Thanks Bear Camp for such a fantastic vacation. The cabin was beautiful and very clean. Great vacation! I love the place and how clean it was. Really enjoyed staying in the cabin with it's great views. Cabin was exactly as stated, Very private,clean. It was very nice eating breakfast on the deck, watching the sun come up over the ridge, surrounded by trees and birds. Even had a tom turkey gobbling around the cabin. We enjoyed our stay. Thanks.